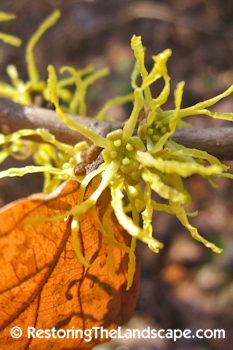 The Witch Hazel in our yard is flowering later than last year which was in early October. With our dry fall, the leaves have browned and have not yet fallen. It makes a nice backdrop to the frilly yellow flowers. 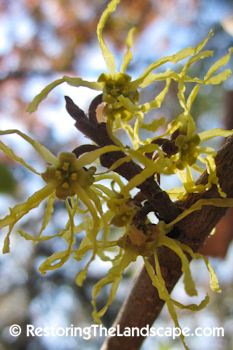 Witch Hazel is a wonderful understory large shrub or small tree. It can be used as a specimen, or incorporated into a partly shaded woodland or woodland edge. Its northern native range is the southeastern tip of Minnesota, but it does grow well in the metro area just north. I plan to capture which insects are pollinating the flowers, since we've had several hard frosts there aren't many pollinators about. Read more about Witch Hazel in an earlier post.